When a tooth is unable to fully enter the mouth, it is said to be "impacted." 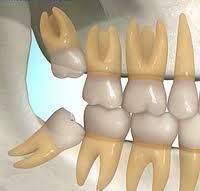 In general, impacted teeth are unable to break through the gums because there is not enough room. If left in the mouth, impacted wisdom teeth may damage neighboring teeth, or become infected. Because the third molar area of the mouth is difficult to clean, it is a site that invites the bacteria that leads to gum disease. Furthermore oral bacteria may travel from your mouth through the bloodstream, where it may lead to possible systemic infections and illnesses that affect the heart, kidneys and other organs. In some cases a fluid-filled cyst or tumor may form around the base of the untreated wisdom tooth. As the cyst grows it may lead to more serious problems as it hollows out the jaw and damages surrounding nerves, teeth and other structures. WIsdom teeth removal can take anywhere from one day to up to five days to recover, depending on the position and location of the teeth, complexity or the surgery, you own health status and healing ability, and compliance to instructions. If it is an erupted upper wisdom tooth, most likely it will revover in a day or two. In general, lower jaw wisdom teeth take much longer to recover. 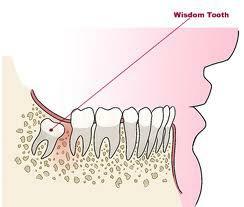 Lower impacted wisdom teeth may need 3-5 days to recover, and swelling should be expected. Dr Shi has extensive surgical training at Columbia University, Hackensack Medical Center, and New York University. He has been performing gentle wisdom teeth removal for many years, and many patients refer their friends and family to Dr Shi for dental surgical needs after they have received satisfactory treatment. Dr Shi’s conservative approach to wisdom teeth removal makes the procedure safe and painless, and recovery is fast.